I have periodic cravings for tuna melts, and I have no idea why. I didn’t eat them particularly often before going wfpb, and I don’t especially love them. But, you know, I still want them sometimes. I had another tuna craving recently so I went hunting for no-tuna vegan/wfpb recipes. 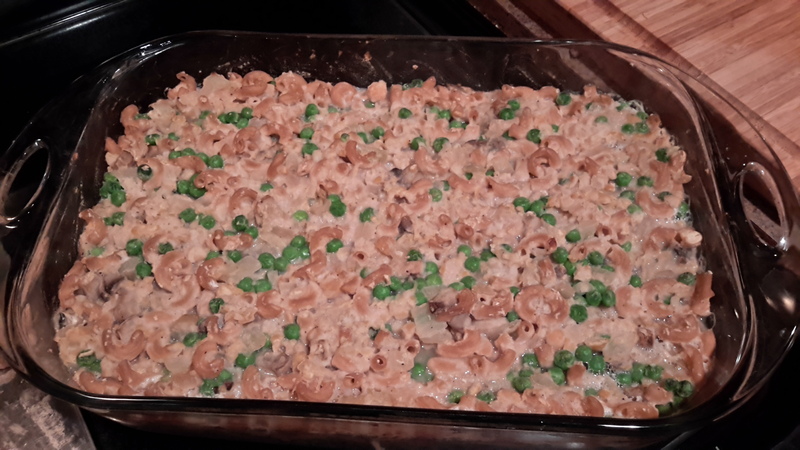 I’m not a huge fan of tuna casserole, but the wfpb version sounded tasty! 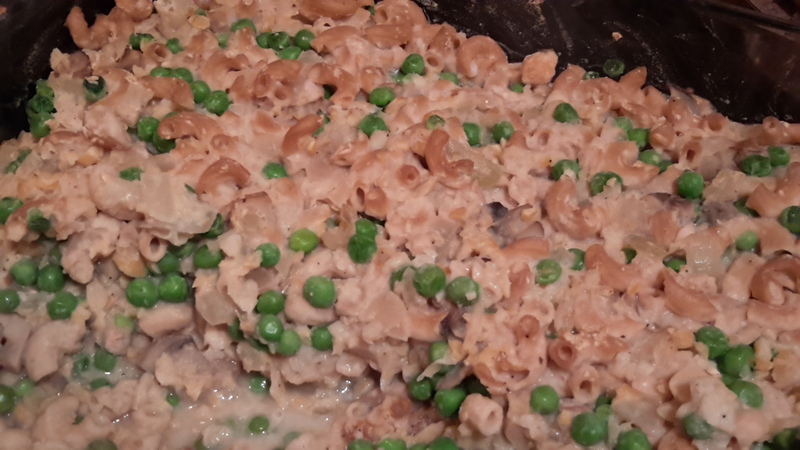 I found this “Tu-no Casserole” over at straightupfood.com. 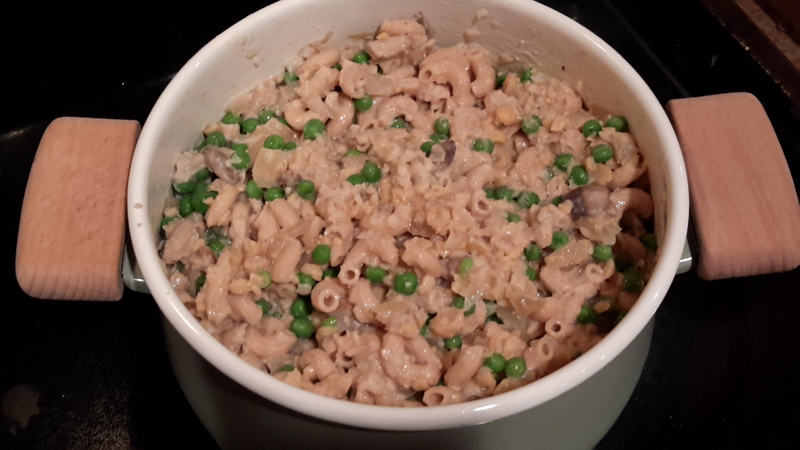 This can also be divvied up and cooked in smaller casserole dishes. If you have not already, put the cashews in warm water and let them sit at least an hour or two to soften up before making this recipe. Add the onions and mushrooms to a skillet on high heat. Cook, stirring, for 5-7 minutes until veggies are softened and lightly browned. Add water as needed to prevent sticking. While that’s cooking, place all the sauce ingredients in a blender. If you’re using cashews instead of cannellini beans, add them when they’re done soaking. Blend the ingredients together until it’s liquidized as much as possible. 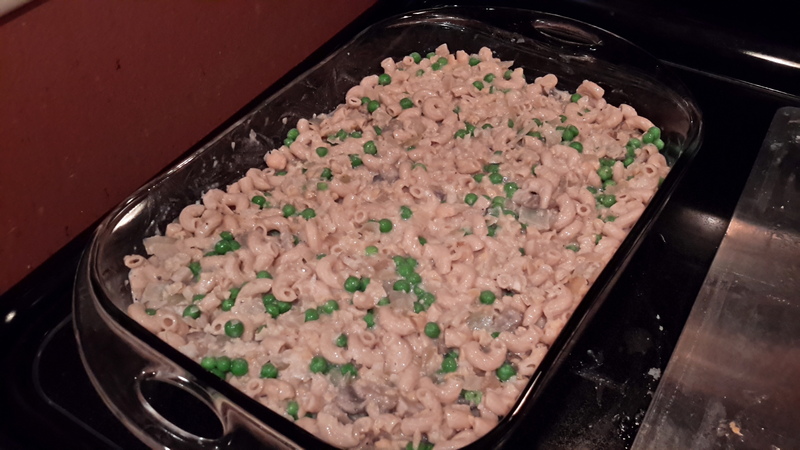 After the veggies are done cooking, add the onion, mushrooms, and peas to the cooked pasta. Dump the garbanzo beans into a food processor and pulse only until the beans are broken down a teensy bit. Or you can smash them with a big spoon or something until they’re broken up. They shouldn’t be mushy! Add the beans to the pasta. Mix mix mix! Spoon the mixture into a 9×13″ baking dish (I only have 10×13, so whatever). Bake, uncovered, for 35-40 minutes. The top should be lightly browned.